So, I only have one question: Who run the world? And Leigh Bardugo, because she can. I have a confession, though. I love Leigh, but it takes me forever to get into her books. It happened with Six of Crows, a five-star for me because Inej, Inej, Inej, Kaz, Kaz & Inej, Inej & Kaz, all of them being shady and doing shady things and me falling in love so hard… Okay, this isn’t a Six of Crows’s review, but my love for that series is too big to keep contained. I was saying there’s always something holding me back when it comes to this author’s first chapters, and the same happened here. It wasn’t bad—Leigh Bardugo can’t write “bad” scenes/chapters or whatever, she simply doesn’t know how to—but it wasn’t as good as the second half of the book. So it took me some time to really get into it. But then… magic! Magic here answers by the name of Nim. OMG, WHO IS THAT GIRL AND WHY DO I LOVE HER SO MUCH? Nim was everything this book needed to finally reach my heart. Don’t get me wrong. I love Diana. Diana is the true heroine of the story, and that’s clear from moment one. The poor girl risks everything, I mean EVERYTHING to save a human, Alia. Then once she learns Alia is sort of cursed, she takes the heroine-way and, instead of letting Alia die, decides to do everything she can to save the girl. If that’s not a sign of a true hero, then I don’t know what is. Alia was also a great character. A girl carrying such a burden but still decided to fight to save herself and the world. One willing to sacrifice if nothing worked. I liked Alia, and the fact that she was Nim’s best friend only made me like her more. Sorry, Nim is that awesome. She makes people awesome by association. That girl was just a phenomenal addition to the Diana-Alia duo. While the other two were much more serious, all their attention focused on saving the world, Nim brought that lightness and humor that made it all sparkle. And then you add Theo to the mix and OMG, YES, PLEASE! Theo brought romance (yes, please, more) and the perfect sort of “we hate each other but we’re friends” dynamic with Nim. And he was Brazilian. Theo was also hilarious. So major points for Theo for just being himself. Leigh Bardugo writes friendship dynamics better than any other author I’ve ever read. This is what makes her special to me—the way she writes these characters you don’t necessarily think would be friends, but puts them in impossible situations where friendship blossoms all the same. And when they start trusting each other and interacting??? Oh, my heart, those scenes are just brilliant. 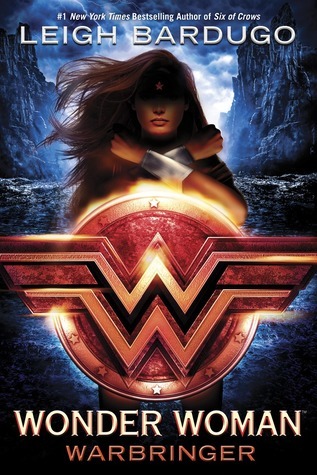 Unlike in SoC, where we had more male characters than females, Wonder Woman: Warbringer is all about girl power, so while Theo and Alia’s brother, Jason, are an important part of the story, the girls are the ones truly shining. And that makes me so happy. So, yeah, Leigh Bardugo wrote an amazing feminist tale with the perfect heroine, the perfect friendship dynamics, and a group of side characters that shone as bright as the two main girls.